Dirt Riding 2011: Season Opener! There I am striking a dramatic pose along Ouray County Road 12 with Cimarrons in background. The high country is still closed up tight. Note that my togs are clean—that won't last long! Woohoo! What a beautiful April 1st, and that’s no joke! I spent the morning getting my trusty 2009 Yamaha XT-250 dirt bike ready for the season, checking tire pressures, the spark plug, tightening this and that, checking the chain tension, and changing the oil and filter. And then it was time to ride! The high country is still hidden under snow, so I confined myself to some of the lower roads in Ouray County, Colorado. As the GPS track below shows, I took a clockwise route, stopping first in Ridgway, then CR 12 to Cow Creek, which to my surprise was dry for quite a ways—I turned around when the mud went all the way across the road—no desire to play in the mud! Thence up CR 12 to CR 10 to CR 8 and up toward Owl Creek. I made it as far as Vista Point. The road from that point is still snow-covered, as you can see in the picture below. Owl Creek Pass Road is snow-covered past Vista Point, wet and slushy today. I turned around at Vista Point, an overlook to the right about a quarter mile southwest (you can see where the GPS track turns back on itself. Back on down CR 8, I snapped this picture looking across Millionaire Valley to the Sneffels Range. You can see how much is still snow-covered. Millionaire Valley, with Sneffels Range in background. You can see how much is still covered snow-covered. From there I headed west along County Road 10. The picture below shows that the cows have calved—the little black things dot the field, with the Sneffels Range in the background. New calves dot the field as the Sneffels Range looks on. The view is taken from CR 10 a couple miles east of US Hwy 550. 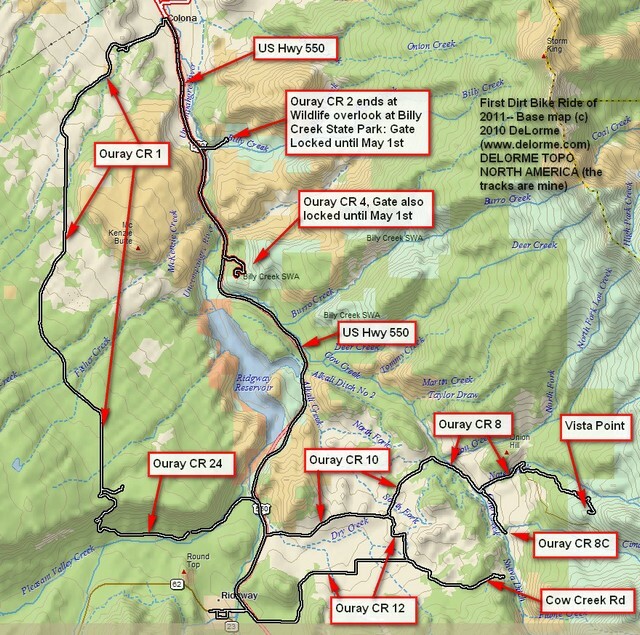 This entry was posted in GPS Tracks, Motorcycling, Ouray County and tagged Colorado, DeLorme Topo North America, dirt bikes, ouray county, Ouray County roads, Yamaha XT-250. Bookmark the permalink.